This entry was posted in Racing on February 1, 2011 by Steve Tilford. It seems that I’ve been proving Murphy’s Law right for the last couple weeks. For most of the trip to Belgium and now back in Kansas. Yesterday I woke at, my now normal 5 am, only to find it 50 something degrees in the house. The furnace wasn’t working. So, I spent the better part of the afternoon trouble shooting the flashing codes and messing with it. Finally after a few hours, I found that the collection sump for the condensation was clogged and it was shutting off the gas. So, I felt pretty smart and lucky. I figure that would have cost at least $300, probably more, and the guy probably wouldn’t have found the problem any faster than me. Then, the weather changed dramatically here in Kansas. I was going to go for a ride before this blizzard hits, but the roads were black ice. I went to the store to get some stuff and it was out of control. You could hardly walk up any isle. It was like the day before Thanksgiving. The gas station in front of the parking lot had lines of cars waiting to fill up. It was supposed to dump up to a foot of snow today, but it seemed like people were being a little extreme in this day and age. So, now Murphy’s Law. The brakes went out on my AWD van last night. Completely out. I nursed it back to my driveway, put on my overalls and got a flashlight. The brake line to the rear wheels is broken above the gas tank. Something completely inaccessible to get to. I called a Chrysler dealer in California, since they were still open, and the guy in the parts department told me they don’t sell the lines anymore. So I have to remove the two brake lines to the back and either fabricate them myself or take them somewhere and have them made. All this with the high temperatures today supposed to be in the upper teen’s. Plus, don’t forget, up to a foot of snow. There is no reason that this broke on the coldest and nastiest day of the winter. It could have very easily broke on a nice sunny, summer day. It is just Murphy’s Law in full force. This might put a damper on going x-country skiing for a few days any time soon. 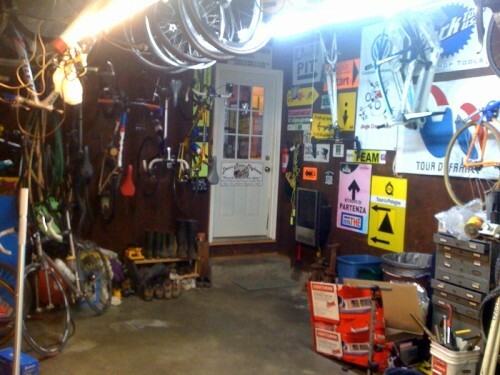 It’s right about now I wish that my garage wasn’t completely full of bikes and wheels. Not close to enough room for a car. But, there will be soon, I hope. 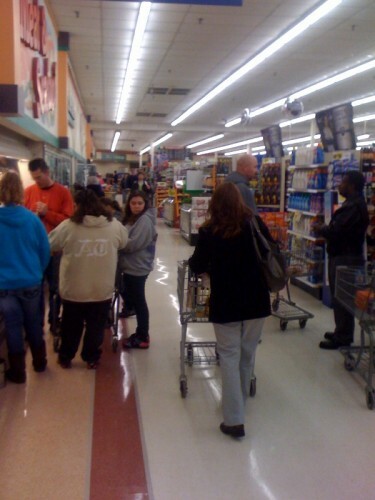 I was just trying to get some fruits and vegetables. Steve: The Tour de France called. They want their logo sign back. Go to http://www.car-part.com type in your VIN number and all the salvage yards that have the part in your area will come up (or nationwide if you so choose). A lot of the Chrysler AWD were Diamler platforms (built in Austria by PUCH I believe) so ironically a Mercedes dealer could actually be of more help – depending on the year of your van of course. What’s Nathan Schafer doing these days? Nathan is blowing glass in Oregon. He coaches one guy who races ‘cross too.